A great many of paper mills use recovered paper to produce new Testliner, Fluting paper. With over 30 years of experience in pulp and paper industry, Leizhan focus on sustaining innovations, creates a series of high efficiency and energy saving waste paper pulp processing machines. Paper plants choose used corrugated containers, kraft paper board, kraft bag clippings and so on as raw materials can produce high strength new Kraft liner board, Corrugated medium paper with Leizhan first-class waste paper processing equipments and technology. One of the first steps is pulping. 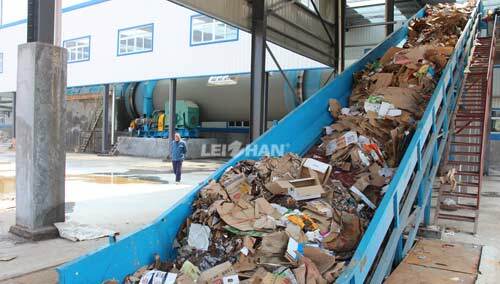 To pulp the recycled kraft, Corrugated paper, the machine soak the waste and do primary pulping and screening. Next, to remove heavy impurities in paper pulp use cleaning equipment High density and Low density cleaner. Screening is the next step, use Mid consistency pressure screen to reject unwanted materials from paper pulp. A common next step is washing. This further cleans the pulp by passing water through it. Sometimes the pulp is then bleached, but only if a white color is desired in the end product.